I love Malin+Goetz skincare anyway; I use the Vitamin E moisturiser most days, so for me this was a bit of a no brainer. Great texture and smells great. N.B. The product photographed is a lab sample. The retail product is much bigger and in a blue bottle. 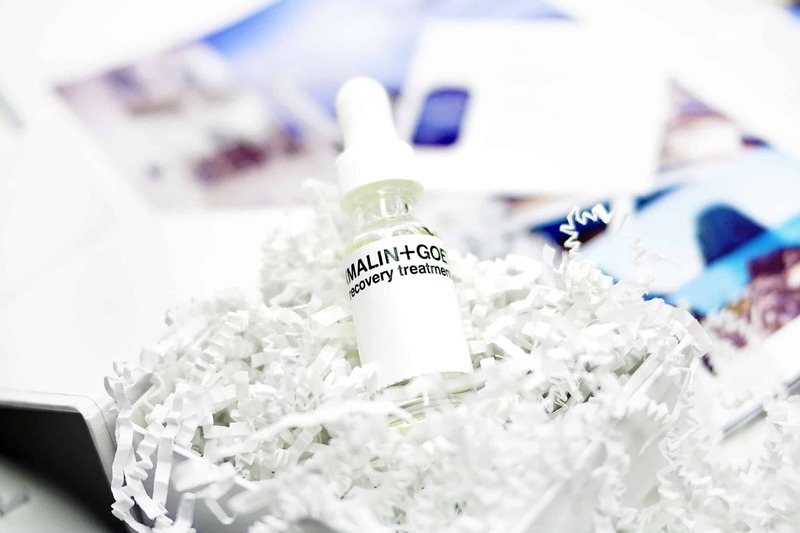 The Malin+Goetz Recovery Treatment Oil has the feature ingredients of evening primrose, argan and jojoba oil which are non-comodegenic and help repair moisture barrier function. Grapeseed and rosehip offer antioxidant protection whilst plumping surface skin cells. Geranium and Borage calm irritation and help to restore normal oil-production function – so great for oilier skin types. Finally Avocado and camellia condition and soften. Those are the feature ingredients, but there’s plenty more including Lavender for calming; sweet orange oil for cleansing/antibacterial properties; softening soya oil; cooling spearmint; bacteria-killing key-lime oil; Vitamin E; squaline for skin barrier repair and finally further bacteria killing grapefruit extract. There’s a lot going on here so it’s easy to assume that it’s very rich and congesting. It isn’t. Malin+Goetz Recovery Treatment Oil is a real power house designed for all skin types as a supplement to your existing skincare. Now there’s a lot of conversation and people have very clear-cut views of whether you can or can’t wear an oil during the day. A good friend and client of mine who’s also an industry leading, movie facialist, tells me it’s a no-go. Why? The skin doesn’t need this during the day, it’s in ‘protect’ mode so is pretty pointless. Also even if there’s a little sun out there, it increases efficacy of UVA/UVB light – so more damage. Facial oils are best used at night when the skin is in the ‘repair cycle’ and will take a product like this in much more easily. So the Malin+Goetz Recovery Treatment Oil is best used at night. Either apply straight onto the skin underneath your moisturiser, or do what I do and take 5-7 drops and mix it with your night cream in the palm of your hand. The hydration ingredients in your night cream will help to pull the treatment oil deeper into the skin. The Malin+Goetz Recovery Treatment Oil works like a night-mask almost; skin feels much softer in the morning and definitely looks plumped. It smells amazing and thus far hasn’t caused any sort of negative reactions. It’s a mostly natural based skin oil so it’s more about skin health than creative dramatic results. 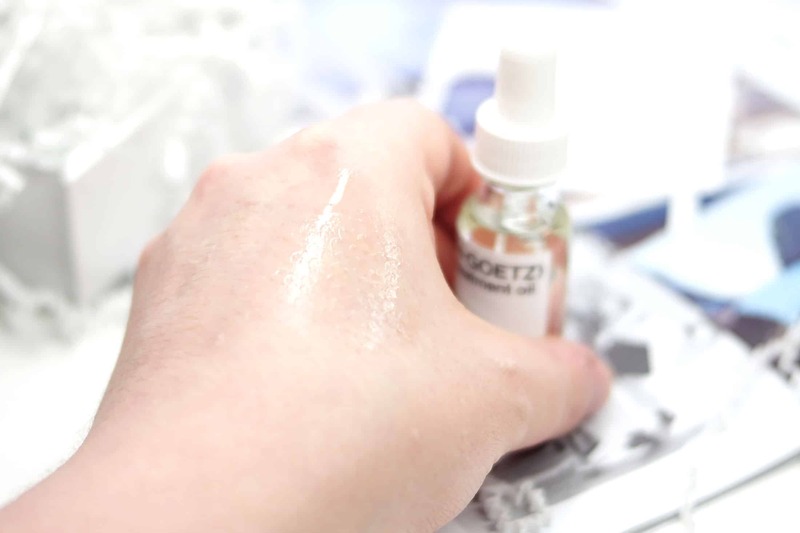 If you’re looking for a skin oil and you’re not sure of what to use for your skin type or skin concern, the Recover Treatment Oil is a very solid place to start. This article first appeared on MANFACE written by Thom Watson. It was published on Saturday 8th April 2017 and was last updated on Saturday 8th April 2017 at 10:14am. It's categorised under Acne, spots & blemishes, Anti-Ageing, Combination Skin, Dry / Dehydrated Skin, MALIN + GOETZ, Oily Skin, Serums & Treatments where you'll find more related content.